This time I have proof that Emma Moros is a girl. Let's assume that there is only one Emma Moros on the Internet. That means it is the Emma Moros seen in this video. Apparently she was a newscaster in Vermont, so that is like being a celebrity. However, in the video she has blonde frizzy hair and in her follower picture she has dark hair, so maybe she is into stuff like changing hair color. I just wish she had plugged www.gweenbrick.com before she started interviewing that Egyptian girl. There are two things even more interesting about Emma Moros, though. One, if you click on her picture, you can see that she belongs to two blogs, this one and one called "Wait a minute jean" or something. If you try to go to stopitjean it says you are not invited. That is kind of hurtful and I have to admit that I felt kind of mad at Emma for locking me out of that blog. I wondered about it all, who jean was, why no one can come to her party, and things of that nature that people who are prone to useless wonderings sometimes find themselves unable to stop wondering about. I especially wondered if Emma Moros was mean and snobby, and maybe should be taken down a peg. That was when I came upon interesting thing number two. In 2003, when she was in the 9th grade, Emma Moros ran 1000 meters in 4 minutes and 35 seconds. Now I am not a sporty guy, but I am willing to bet I can run 1000 meters faster than that. As a side note, when I was in 9th grade, I played flag football. One time I drew a foul by clipping another player, and I kept asking my coach if I should apologize to the offended party. Eventually my coach asked me what the hell was wrong with me. Anyways, I should look up how far 1000 meters is so I can be even more confident. Half a mile? What the hell? I'm not running that. Is what I would say, if I hadn't discovered that 1000 meters = 100000 centimeters. Centimeters are tiny. I can run centimeters with my eyes closed. Though as the amount of centimeters rose I would probably crack my eyes a little, and than more, and than eventually wide open because any fool knows the more centimeters you run with your eyes closed the more likely you are to get hurt. But that is neither here nor there, because now it is so on. Which is something that people of the sports like to say. It feels good to say it too. It especially feels good to italisicze it. But it doesn't feel good to try and remember how to spell italisize. I like it how when you Google "How do you spell hightailitsize" Google kindly suggests how feeble you are by saying what you meant to search for. Its an unusual word actually. I bet Emma could have spelled it right, dammit. But laugh it up, Speedy McAwesome Speller, you are about to go down. People of the sports say that too. 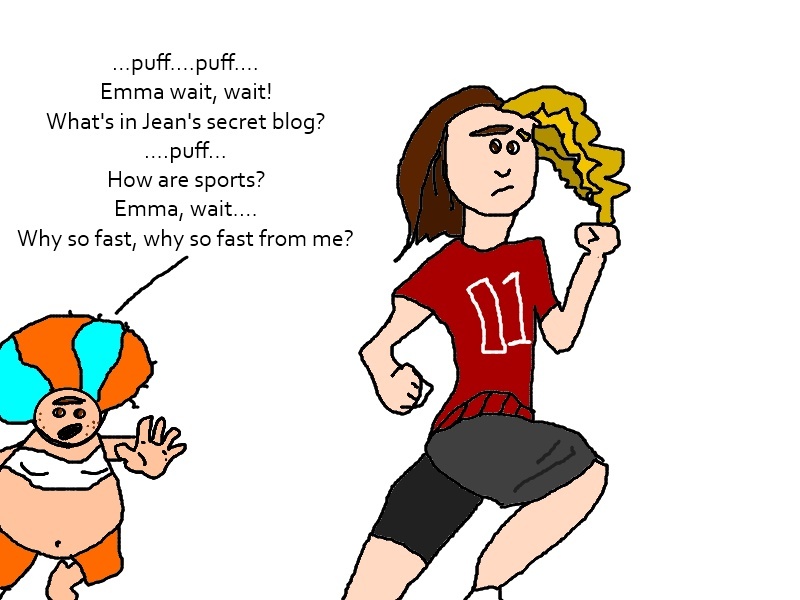 Before Emma and I race however, there are a few understandings I would like to make known. Understand that I was a smoker for many years, and still would be if someone knocked on my door right now and offered me one. Consequently my cardiovascular health can be described as the sound of lungs crying out in pain when asked to provide oxygen for the effort required to successfully shut a car door. Understand that I weigh more than Emma does, and therefore require a headstart to be able to throw off the foggy headed-ness brought on by the transition from potential to kinetic energy. This is because the heavier you are, the more potential you have to do something, because you are always telling yourself how you are going to do things like lose weight and befriend people of the sports and stuff. Runny people like Emma are disgustingly kinetic. With that out of the way, I challenge you Emma Moros to the 1000 meter dash (for you) and 100000 centimeter in your face (for me). One more thing: lets just ride the elephant in the room here (sports talk again maybe) and say, yeah I am bald, less wind resistance, I know, not fair. Quit whining, Emma. I will figure out something to wear to even the odds. So it's a little weird that you could find out this much about me through Google, but my girlfriend and I had a great time reading this! Couple details wrong, though: I am the person being interviewed, not the newscaster. And my hair looks much better in person. Other than that, I am basically a running, snobbily exclusive blog fiend. Looking forward to that race! Keep up the blogging. Hi Emma. I knew you were the person being interviewed, I was just pretending to be stupid; but since several people have tried to correct me about this, I just ended up becoming stupid in the eyes of several people and now you are part of this small group that considers me stupid as well, which actually might work to my advantage when you underestimate me on the day of our great race. You will probably think I am going to run all weird or something, or backwards maybe. Hah to you, my friend. I am going to run in a straight line. With some speed, and allowing for any advantageous curvature in the track or natural wavy patterns in the ground, or if there are cracks I must avoid in order to prevent accidental breakage of my mother's back. Or other stuff runners think about when they lace up their hightops.